Choker in fabric and metal. Proper, but not stale; subtle, but true to its roots: this Schuhmacher necklace unifies tradition and modern styles in an elegant design. 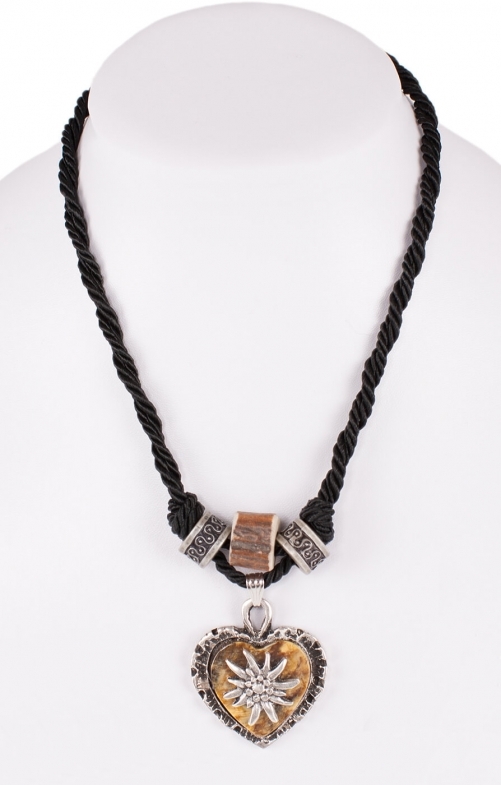 The black textile cord forms the central structure of this choker and is adorned with gemstones and a heart-shaped pendant. The heart is engraved with an edelweiss motif, giving the choker its Trachten feel, while silky satin builds an exciting contrast. Combined with a deep cut dirndl blouse, this sophisticated choker really comes into its own, making its wearer look fabulous whatever the occasion. But it also looks great worn outside of Oktoberfest, of course – it’s typical Schuhmacher!